When a major earthquake strikes the Bay Area, it could take months to reestablish essential services and years to rebuild. Successful recovery will depend on whether or not we make good land use planning decisions now. Local jurisdictions that lay the groundwork for rebuilding — by continuously updating their general plans and zoning codes before a major disaster — will be in a much better place to begin a conversation with residents about a recovery vision. By understanding local earthquake hazards and addressing them before the next disaster, we can reduce the amount of damage our cities will face and the amount of rebuilding that will be needed. And by making needed regulatory changes now, governments will have the tools they need to facilitate recovery. 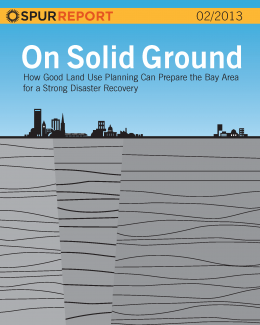 On Solid Ground provides recommendations for work to be done before the next earthquake occurs, as well as important steps to take afterwards, as we begin to rebuild. The SPUR Board of Directors reviewed, debated and adopted this report as official policy on November 14, 2012. Gore, Jerry Ramiza, Mark Shorett and Michael Tymoff.